The range of music that Chiptune artists can squeeze from old video game consoles is unbelievable, but at the same time that’s hardware that was specifically designed to produce a range of sounds to accompany a game. 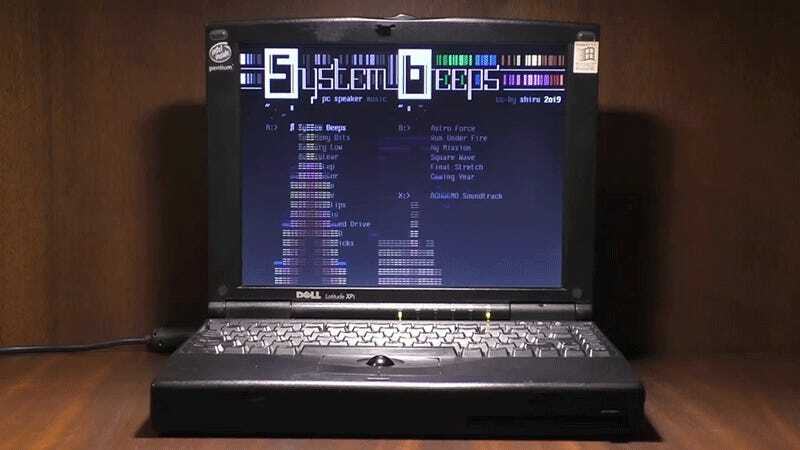 Alexander Semenov, however, managed to create an entire Chiptune album using only the sound capabilities of a motherboard’s incredibly limited built-in speaker. The sounds generated by a motherboard are, for the most part, designed to be used for diagnostic purposes. Simple beeps and bloops help indicate it’s powered up, or that you’ve successfully saved changes to its settings, or that all your hardware is working properly—but that’s about it. Back in the ‘80s, before dedicated sound cards in a computer were a thing, game developers found ways to manipulate a motherboard’s limited sound capabilities to add soundtracks and effects to DOS games, but decades later, Chiptune artists now typically stick to consoles like the Game Boy or the NES to compose their music. It took him almost a year and a half to complete, but Semenov’s System Beeps is a surprisingly listenable (if you’re into Chiptunes), 26-minute album with 23 tracks that show off various tricks and techniques to getting unique sounds from classic PC hardware. He’s posted the entire album to YouTube for your enjoyment, but if you can spare a 42 Kb download, you can also download it as an MS-DOS program and play it on your own X86 machine, or through a DOS emulator. Enjoying Semenov’s PC Speaker compositions is relatively easy, but creating your own is where things get challenging. As he elaborates in this lengthy explainer he created, you have to not only work within the limitations of the hardware (making hi-hat cymbal sounds was impossible), you also have to find clever ways to expand what the hardware can do (using known auditory illusions to make some quiet sounds more apparent to a listener). Working around the many technical limitations becomes as much a part of the art as the final album.